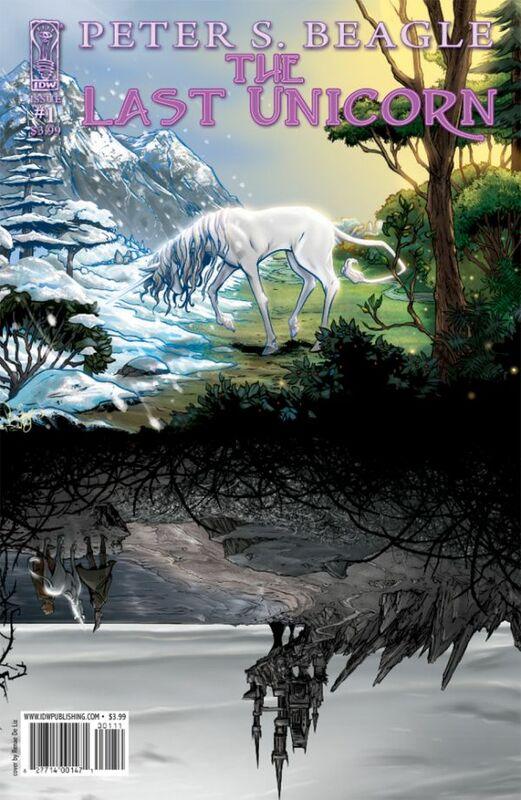 This will be possibly one of the world’s least impartial reviews, in that my love affair with The Last Unicorn started when I was about six, when I first saw the animated movie adaptation, then proceeded to sort-of forget about it in such a way that it became a native feature of my mental landscape. For a really, really long time, I thought it was actually a really amazing, really sad dream that I had once had. For all that it’s typically praised as “whimsical” and “charming,” it’s also a story that’s profoundly concerned with mortality, sacrifice, and loss of wonder and innocence, all of which was both troubling and stirring to me as a child. Attached to my dream/memory of it was both a great yearning for the film’s melancholy, twilight-shaded beauty, and a certain sense of haunted anxiety. Like many other fans, I didn’t rediscover the movie till years later, after which I proceeded to re-watch it an egregious number of times, attempt (unsuccessfully) to foist it on friends, and finally, very belatedly discover that it was based on Peter S. Beagle‘s 1968 novel. Said novel, read at twelve or thirteen, went on to become part of what I think of as my core canon; I’m often hard-pressed to find the words to explain how much it means to me. Given all this, I was a bit leery but mostly excited to see the news this spring that IDW would be releasing a six-part comic adaptation of the novel, under Beagle’s supervision, adapted by comics writer Peter B. Gillis,with art by wife-and-husband team Renae De Liz (pencils) and Ray Dillon (ink and color). Being the sucker I am, I immediately sprung for the signed preorders (hey, signed and inscribed copies ship for free, so it’s like I saved money… right?) available via Conlan Press, Beagle’s affiliated publisher. Recently I got around to sitting down with the first installment. 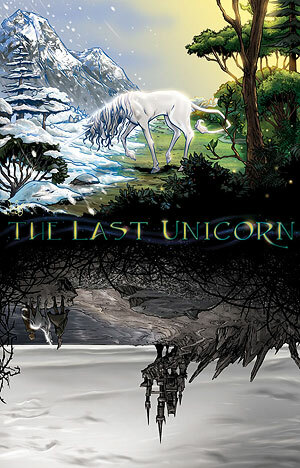 A blow-by-blow review follows, with quotes here and there from the original novel – which, for those who have not encountered it in one form or another, is the story of a unicorn who learns one day that she is the last of her kind in the world, and leaves her wood in order to seek out her imprisoned kin. She did not look anything like a horned horse, as unicorns are often pictured, being smaller and cloven-hoofed, and possessing that oldest, wildest grace that horses have never had, that deer have only in a shy, thin imitation and goats in a dancing mockery. Her neck was long and slender, making her head seem smaller than it was, and the mane that fell almost to the middle of her back was as soft as dandelion fluff and as fine as cirrus. She had pointed ears and thin legs, with feathers of white hair at the ankles; and the long horn above her eyes shone and shivered with its own seashell light even in the deepest midnight. That aside, it is a pretty gorgeous cover, and one I’d like to see as a poster. 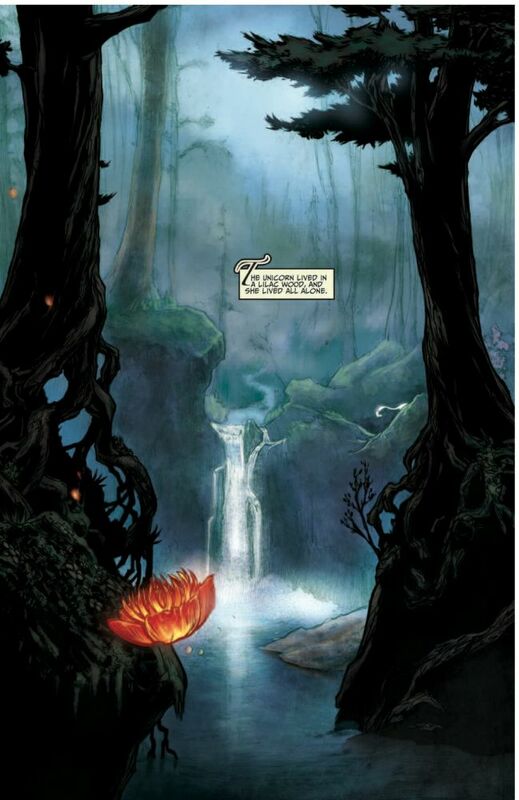 Just about every page of the comic is similarly lovely to look at, with well-rendered environments, evocative paneling, and a rich, sunset-y color palette. I’m generally not fond of most digital coloring jobs done for comics, and Dillon’s work does occasionally hit the combination of superglowy soft-edged airbrush + obviously applied textures that sets my teeth on edge, but I quite like the atmosphere he creates with his color choices. In particular, I liked that he chose to always ink the unicorn with paler colors, which evokes both her radiance and her dreamlike superposition on the harder edges of the real world. Unfortunately, though De Liz’s human characters are expressive and realistically worn – I’m horribly excited to see her Schmendrick, Molly Grue, and Prince Lír – I still wasn’t really sold on her unicorn, which is both anatomically shaky and perhaps a little too indebted to the animated unicorn’s aesthetic. Hard to blame the artist for it, since she’s also apparently a fan-since-childhood of the movie, but it would have been nice to see a fresher interpretation. She was very old, though she did not know it, and she was no longer the careless color of sea foam, but rather the color of snow falling on a moonlit night. But her eyes were still clear and unwearied, and she still moved like a shadow on the sea. All in all, despite my reservations, I’m greatly looking forward to the upcoming issues. The comic promises to be a thoughtful, atmosphere-rich adaptation, and one that I hope helps to introduce a new generation of readers to Beagle’s work. In addition, the last few pages of the issue feature the first segment of a meaty and entertaining interview with Beagle himself, which covers his earliest years of writing and traveling in proto-hippie America. Mpghrr…for me the artwork is smack dab in the “TURBO DIGI-GLOW* + TURBO SPOTBLACK” that I hate. I also never read/watched the movie as a kid. Most movies from the 90s/80s that are non Disney I can’t re-watch. My brain keeps pointing out the glaringly bad animation. * hypocritical powers to the MAX. I am guilty of over saturated colors in much EVERYTHING I do. Even cooking. http://hanna.aftertorque.com/ is one of the few comics that make use of OVERSATURATION and SUPER SPOT BLACK, teamed with SCREENTONE OVERLOAD that I like. Thanks for buying the series (and thanks for buying it through COnlan Press). And thanks also for the detailed, thought-provoking review, which I shared with Peter and Peter and Renae and Ray and everyone at IDW. Peter B and I are both thrilled at the work Peter G, Renae, and Ray have put in on this series (not to mention the remarkable editing job from Mariah Huehner). I look forward to finding out what you think of issue#2, which is out now, and issue #3, which is at the printer and will be out soon. In the first issue Renae and Ray were finding their feet with this setting and these characters, and dealing with a few other distractions besides (Renae did give birth to her first child just a bit after finishing her issue #1 pencils…). In issue #2 and beyond I think you’ll see their work getting steadily stronger, more certain, and all the more amazing. 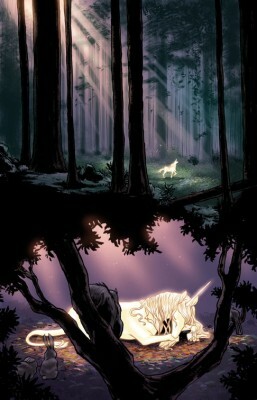 1) About five years ago we had a deal in place with Scholastic to do a LAST UNICORN graphic novel. Vess and Kaluta were the two names I suggested to them as possible artists. Vess passed (or so I was told). Kaluta said yes — though all he completed before I pulled the plug on the project was a handful of early character sketches. Now, Kaluta is an excellent artist, but those sketches made plain that he was forcing THE LAST UNICORN to fit within the limits of his style, rather than stretching to encompass what the story really wanted. Renae and Ray, by contrast, have been pushing themselves to brand new places — and in every case what they have come up with is distinctly superior to Kaluta’s conceptualization. Peter and I are *very* happy that they are the artists on the project, and not Michael. As to why I had to pull the plug: Scholastic wanted to dumb the language down beyond belief, and compress the story until it was virtually unrecognizable. The kind of script Peter G is doing for IDW would never have been acceptable to them. Just by way of one example, the portion of the tale that takes 12 pages to tell in the first IDW issue was chopped by Scholastic to fit into just 3 pages, one of which was a scriptless splash. It was awful. 2) The issue #1 cover was indeed originally designed with a centered title. But it wasn’t designed to be a real cover — it was, rather, the first concept piece that Renae and Ray did when they were auditioning to get the gig. We all just loved the result so much that we had to share it with everyone, even if real-world title placement requirements didn’t quite match up. And about the project’s past incarnation – THANK YOU a hundred times for finding a publisher, and a team of artists, that did respect the source material. There’s nothing more painful than an adaptation that sacrifices content, style, and heart for imagined mass appeal, or that otherwise involves some horribly fundamental misunderstanding of the source material. It seems to happen far too often, so it’s hugely relieving to know that at least one of the works that I really care about is in good hands. It’s obvious, reading the comic, how much everyone working on it loves it – which I think was a huge part of why I, in turn, loved reading the comic so much, quibbles aside. Renae De Liz has an extraordinary *conceptual* gift as a cover designer, and as a result I’ve been absolutely adoring her blazons for each issue. I’ve seen all 6 now. Each (in its own way) is stunning, and #6 is phenomenal. The B covers by Frank Stockton didn’t start out as strongly for me — I prefer a differently-colored version than was done for #1, and #2 I had mixed feelings about. But his pieces for #3 and #4 are gorgeous, his cover for #5 is really good, and if his final cover for #6 lives up to the sketch…wow! I look forward to offering fine art prints through Conlan Press, both individually and in sets, of all 12 designs. I’m hoping to get Frank and the Renae/Ray team to do some special LAST UNICORN pieces separate from the comic covers and pages.